The outer bark is peeled away and discarded. Cinnamon from Sri Lanka (Ceylon) is considered the best; Indonesian Cinnamon (Cinnamomum loureirii) is considered the second best. Cinnamon is often compared with Cassia Cinnamon. Food writers go on and on about Ceylon Cinnamon being the true Cinnamon; in fact, it’s probably de rigeur for them to do so. Pontificate as they may, though, it’s a losing battle in North America and in Southern Europe, where most people actually prefer Cassia Cinnamon. And besides, there are times when the Cassia is actually better. The Cassia Cinnamon stands up better in curries and in savoury dishes, and Cassia Cinnamon Sticks don’t fall apart in liquid like Ceylon Cinnamon Sticks would. Ceylon Cinnamon is better in baked goods. Cinnamon comes in sticks and as a ground powder. 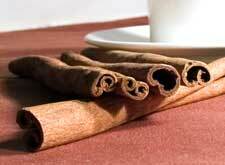 Cinnamon was used by the Egyptians as early as 3000 BC. It was mentioned in the Old Testament, though the variety they had access to was the Cassia variety. Herodotus, the 5th century BC Greek historian, recounted the tales that the Arabs spun to throw Europeans off the scent of where Cinnamon came from. The Arabs said that it grew in swamps, protected by ferocious birds. The birds used twigs of Cinnamon to build their nests on top of inaccessible cliffs. Natives would tempt the birds with large pieces of meat: when the birds carried the meat to their nests, the nests would tumble over the cliffs down to the ground where they could be collected. In Rome, Cinnamon was literally worth more than its weight in gold. Ceylon Cinnamon only became available to Europe in the 16th century. Before that, Cassia Cinnamon was second in popularity only to pepper during the Middle Ages. When Cinnamon trees grew just in the wild, they would grow up to 50 feet (15 metres) tall and it would be hard to harvest all the branches. The Dutch introduced plantations, where the trees were cultivated and kept under 8 feet (2 1/2 metres) tall, which both made all the branches easier to reach and encouraged the trees to grow lots of little branches. 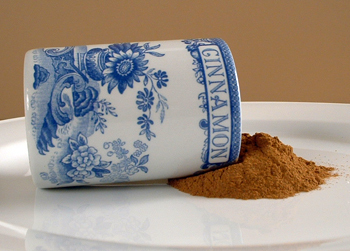 In the 1400s, Cinnamon was spelt “Synamone” in English.